Dusted off your lawn loungers yet? 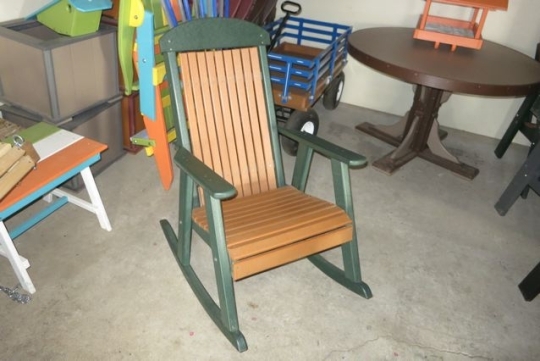 Outdoor rockers, tables, and chairs are a big part of the Amish furniture repertoire. 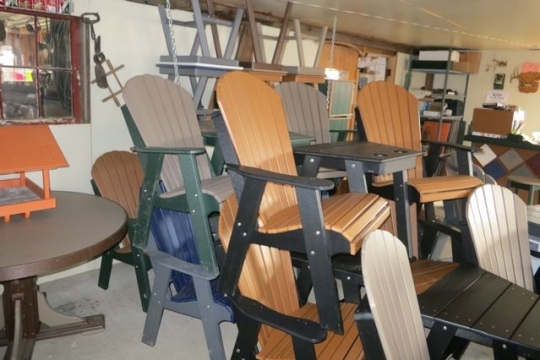 Amish outdoor furniture shops have been gearing up across the land for sun-hungry customers ready to plop down some cash–and then plop down on the lawn for some much-needed rays. 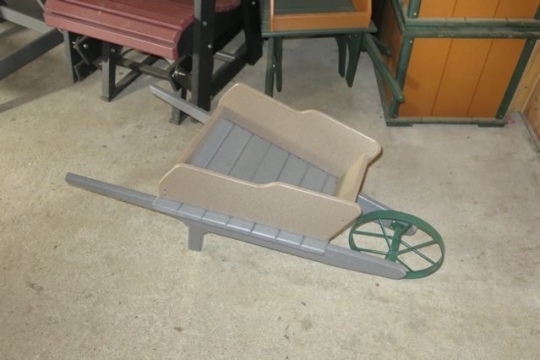 Today Tom shares photos of Amish lawn furniture pieces from Raymond’s shop in the Conewango Valley NY Amish settlement. Stocking up for the spring, the shop has amassed a large inventory. Somebody had a little fun here. Poly furniture is made from recycled plastic coming from waste products like detergent bottles and milk jugs. Poly lumber is durable and comes in the full palette of colors. Could you see this on an Amish lawn? From RVs to home entertainment centers, Amish manufacture products they might not use themselves. 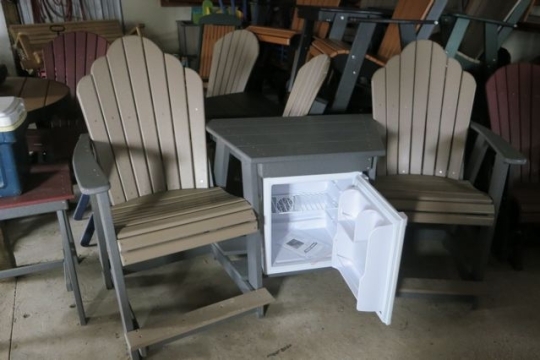 This mini-fridge/dual seat combo is a deck junkie’s dream. It’s electric so you probably won’t find this version on an Amish deck. Though who knows, there may be a propane model for the Amish market. I would want one of these, but I’d only be able to really use it a couple months of the year. It snowed in PL twice last Sunday. It’s the inverse of Pinecraft, Autumn follows Spring. What a treat to see this furniture outside splashing their great colors! Tell me where can I buy this? Living in Idaho there is no Amish stores to buy from. We have a store here called ‘Heritage’ that sells some Amish merchandise. Also, how much is it? Thank you. Love my poly "bentwood" rocker! Last fall, I bought a poly “bentwood” rocker made by an Amish furniture shop in Holmes County, Ohio, and I love it. It’s very comfortable, easy to keep clean, and guaranteed to survive the elements. As soon as I sit there, our chocolate lab brings his rubber ball and drops it in front of me so that I can play catch with him. That poly furniture is so cute ~ and it’s really comfortable. I don’t know how much they charge, but at a shop sort of near us, one chair is upwards of $300. I’d consider it an investment I guess. 🙂 That little table with the fridge – HOW CUTE! That table with the fridge is something my husband would go for. I could see a couch potato person even buying one to keep close to the sofa with soft drinks and snacks. First time to have seen that type of thing. The chairs I have seen before and they are worth the cost as they last so much longer than the wood chairs and the cheap plastic stuff. Just spray off with a hose and they are clean! The furniture is beautiful, but we are not ready for lounging around the lawn yet – woke up to four inches of snow this morning! I bet you could run that little refrigerator off of a solar panel with battery for storage. Once again Tom, thanks for sharing your photos. Absolutely awesome!! I could go for the chairs and fridge combo as I like to sit outside a lot in nice weather. Would be nice to keep some tea and soda in there, especially for company that might stop by for a visit. And I love the “Adirondack” style chairs. They have always been a favorite of mine. I can see the durability in the poly type. I am so glad they’re (Amish and others) making outdoor furniture using the poly-wood! We live less than a mile from the river which causes (believe it or not) a type of algae buildup on roofs and outdoor items. All that scrubbing to keep the wood clean takes a toll, and the outdoor furniture doesn’t last long (plus, we have very hard water). 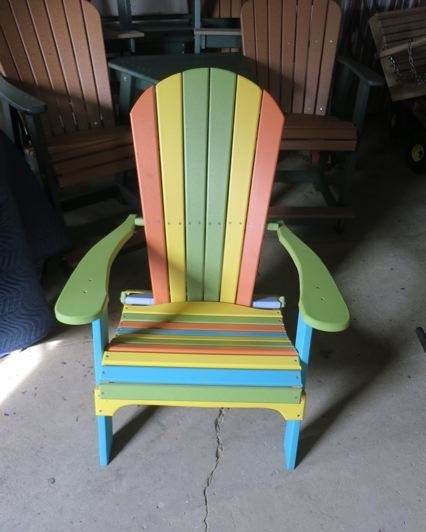 I would love to get a mini-version of that colorful chair for my little granddaughter to use when she visits! I agree with Alice Aber about the fridge/chairs combo…neat idea! I’m sure the “fridge” could be adapted to a nice “icebox” or Igloo-type cooler—fill it with ice—maybe have a drawer rather than a door—and some bottled drinks, maybe even lunch, and putter in the garden all day, not having to track mud and grass clippings into the house. When the ice melts, use the water for plants. As usual, Tom, thanks for your awesome photos of interesting subject matter! There are a few Old Order settlements in Irvngton and some none Amish stores that carry this style of outdoor colorful yard art. We saw some of this kind of furniture at the Westcliffe, CO Amish store, as well as some in Yoder, KS, just in the past few weeks. Great stuff, and you know it will last forever — however, it is a little pricey (at least at those two stores), so I will have to save my pennies up! I have an Amish dresser that I absolutely love. We bought it at our local furniture store, but it was Amish made in Wisconsin. Erik, thanks for sharing your blog with Tom & others. Tom, Thank You so much for today’s photos. I love wood/wood-type furniture. All shots screamed for me to window-shop the local flea market for some furniture. Lee Ann, I’m the couch potato you’re thinking of! I love the idea of having a multi-functional bench/table/fridge in my living room. I think many urban, small apartment dwellers who love Amish or country design would too. For all those who mentioned snow, my sympathies, here in S’west MO our spring is like 20 degrees above normal. I would like two of the palette chairs with the fridge for my porch. I am sure that set is out of my price range. At the new apartment I live is a porch out the side. I can see sitting out there reading a great book with tea, ice coffee and some snacks in that fridge. Amish do really great work. Right now we are in the 40’s. Summer is coming though.